Facade wall panels ... premium products. 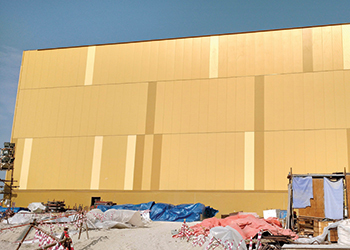 Leading UAE-based roof and cladding company Tiger Profiles has won certifications from FM Approvals for its entire range of roofing and cladding panels. This is the second time Tiger Profiles has earned certification from FM, having earlier won certification for its T-Seam Standing seam roofing and cladding system, in 2009 as Class 1 as per standard 4471. Bernard Nasr, the managing director of Tiger Profiles, says the certification includes Class A classification as per FM Approvals, Class Nos 4411, 4651, 4880, 4881, 4882 for walls and ceilings; and Class No 4881 for interior and exterior use. Amongst the approved products are the TR 45/150 and TR 45/250 insulated roof and wall panels (both steel and aluminium facing). “These may very well be the only roof panels that are approved with aluminium outer skin in this class of insulation options which include PIR (polyisocyanurate) and mineral wool,” says Nasr. Other products winning approval include concealed fix wall panels, known for their hidden fastenings which ensure a clean and aesthetically superior look and feel. These panels have also successfully passed NFPA 285. Additionally, the cold store panels, and tongue and groove (partition) panels have also been certified. The NFPA 285 test ... success. He says the façade panels, which have been used in many landmark and iconic projects, successfully passed the criteria for the NFPA tests applied in both horizontal and vertical orientations, “proving that they are most certainly premium products”. Nasr continues: “The NFPA 285 provides a standardised fire test procedure for evaluating the suitability of exterior, non-load bearing wall assemblies and panels used as components of curtain wall assemblies that are constructed using combustible materials or that incorporate combustible components for installation on buildings where the exterior walls are required to be non-combustible. “The NFPA 285 requires both visual observations made by laboratory personnel conducting the test and temperature data recorded during the test. It is important to note that NFPA 285 is an assembly test,” he adds. Tiger Profiles’ products underwent multiple testing late in 2016 and earlier this year, including the important ASTM E84 test on its exposed/naked foam cores as well as its double skin panels (two metal facings). Both its exposed core and concealed fix and faced panels passed the tests and are classified as Class 1 or A. 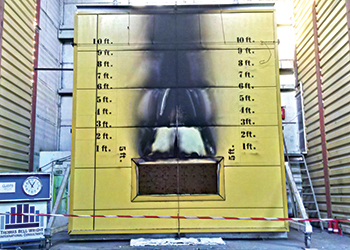 “This fire-test–response standard for the comparative surface burning behaviour of building materials is applicable to exposed surfaces such as walls and ceilings,” Nasr explains. Tiger Profiles offers a one-stop-shop offering design, engineering, manufacturing, supply and installation services for its T-Seam standing seam roofing, Tiger Engineered Building System, K-Span system, PUR/PIR/rockwool (insulated trapezoidal roof and wall panels and partition panels, and insulated concealed fix wall and facade panels); single skin roof, wall and floor profiles; single skin versatile tiles for roofs, walls, domes and columns; cold formed sections and accessories, including C and Z purlins and channels, and flashing; and versatile smart cladding solutions. “PUR/PIR insulated cold store panels are produced using patented technology, thus making Tiger Profiles the world’s only automated online producer of cold store panels with online Camlock production,” says Nasr. Tiger Profiles has received certifications from ISO (9001 and 14001) OHSAS (18001), FM Approvals (T-Seam), Abu Dhabi Civil Defence, Dubai Civil Defence, and DCL; and is a member of the US Green Building Council, Middle East Solar Industry Association, Clean Energy Business Council, and Emirates Environmental Group. It is also a supporter of the UN Global Compact.